Have PMS? 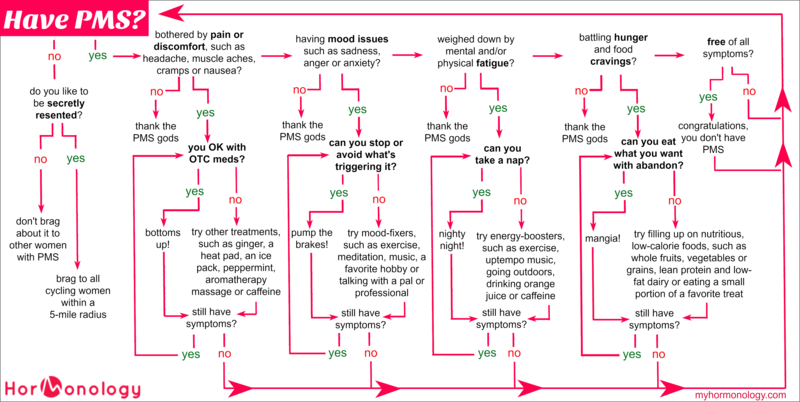 The Hormonology PMS Flow Chart helps you navigate it like a pro! Home > cheat sheet > The Hormonology PMS Flow Chart! 04 Jun The Hormonology PMS Flow Chart! Have PMS? Here’s the ultimate Hormonology PMS Flow Chart that helps you navigate it like a pro! Use the tips to ease every symptoms–including pain, mood issues, fatigue and hunger. Then high-five yourself when you’re symptom-free! 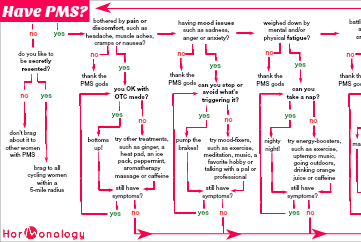 PMS Flow Chart: Have PMS? Bothered by pain or discomfort, such as headache, muscle aches, cramps or nausea? Are you OK with OTC meds? Yes? Bottoms up! No? Try other treatments, such as ginger, a heat pad, an ice pack, peppermint, aromatherapy massage or caffeine. Having mood issues such as sadness, anger or anxiety? Can you stop or avoid what’s triggering it? Yes? Pump the brakes! No? Try mood-fixers, such as exercise, meditation, music, a favorite hobby or talking with a pal or professional. Weighed down by mental and/or physical fatigue? Can you take a nap? Yes? Night night! No? Try energy-boosters, such as exercise, uptempo music, going outdoors, drinking orange juice or caffeine. Battling hunger and food cravings? Can you eat what you want with abandon? Yes? Mangia! No? Try filling up on nutritious, low-calorie foods, such as whole fruits, vegetables or grains, lean protein and low-fat dairy or eating a small portion of a favorite treat. Free hormone cycle know-how? Sign me up!